"The plan is to get over Gillian. It's been two years. I'm not over her." David E. Kelley's work on Ally McBeal and Boston Public can be described as heartfelt with a side of quirk. His characters are always emotional wrecks, insecure and petty. He tends to tackle obvious "big" issues with the subtlety of a sledgehammer (particularly on The Practice). He then crams in a lot of weird character traits or moments that add some forced humor. Of course, Kelley has his fans, and I'll admit he is a talented man if he can oversee three television shows at once. But I'm no fan. To Gillian on Her 37th Birthday, written by Kelley and directed by Michael Pressman, is fairly typical of the writer in "serious" mode. Peter Gallagher plays David Lewis, a man shattered by the death of his wife, Gillian (Pfeiffer), who was killed in a boating accident on her 35th birthday. Two years later, he is still deeply depressed, and his family is worried about how his moods are affecting his teenage daughter (Claire Danes). On the anniversary of Gillian's death, they try to set him up with someone new, forcing him to decide if he can really ever get over his late wife. For all intents and purposes, the film should still work�the story of a man coping with grief is nothing new, but done well it can be a very cathartic experience, helping the audience to deal with their own losses (see Truly Madly Deeply for a good example). Kelley even adds a unique twist by having Gillian appear to David in hallucination-like visions, revealing just how deeply detached he has become. But Kelley's dialogue is too false and showy, and his answers too easy. Emotional arcs are as telegraphed as on his TV programs, wrapped up at the end of 90 minutes. The cast elevates the material a bit, particularly Gallagher and Danes, the latter playing an impetuous teen every bit as well as she did on My So-Called Life. Michael Pressman's direction is fine�he casts David's delusions in blue filters, sharply contrasting from the warmth of his real life�but all the good performances and competent direction can't save a trite script. Image Transfer Review: For some reason, Columbia TriStar has decided to offer the film in a modified 1.33:1 transfer only (though the box says it has been "digitally mastered"). It's a pity, because the full screen image is fairly good, with bright, saturated colors that accurately reflected the shifting tones and filters used throughout. Artifacting and edge enhancement aren't much of a problem, and only minor aliasing is visible on some horizontal surfaces. Audio Transfer Review: Audio is offered in DD 2.0, and the mix is unremarkable. The front soundstage is somewhat expanded by the score and frequent pop songs on the soundtrack, but for the most part this is a dialogue-based film with little need for audio trickery. Some dream sequences feature an echo effect and there are a few instances of directionality, but for the most part this is a basic mix that fits the film fine. Extras Review: The only extras offered are English subtitles and a trailer gallery with clips for the feature, The Age of Innocence and My Life. 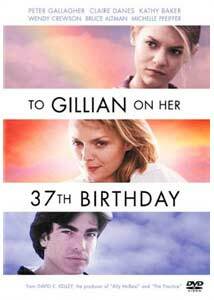 To Gillian on Her 37th Birthday is nearly as pretentious and contrived as its title, and despite strong performances from Peter Gallagher and Claire Danes, it remains a muddled and distant film. Columbia TriStar's DVD isn't worth the high price tag unless you are pleased with butchered aspect ratios.